The newest flavor in Goose Island's family of handcrafted sodas has finally hit the shelves. Black Cherry Cream is one decadent soda and adds yet another dimension to Goose's promise of creating "The Richest and Creamiest Sodas." Torque designed the packaging system for the Goose Island Handcrafted Sodas and was happy to add yet another goose to the flock. 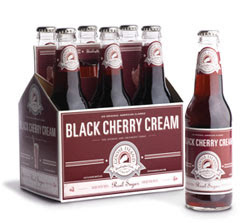 The visual design of Black Cherry Cream is a testament to the value of rigid graphic standards. A rich cherry red color was chosen to complement the color and flavor profile of the new soda and then the graphic system we set up 2 years ago took care of the rest. The system helps keep costs down for the client and reduces the amount of lead time they need to give us to create a new soda flavor, it's a win win situation for them. Look for Goose Island Black Cherry Cream Soda and the other three flavors of Goose Island Soda in your local grocers aisle. To see more of our work on the Goose Island Soda Brand click here to see our online portfolio of packaging work.